Wow, it has been way too long since I have updated my blog. Once the school year starts, my time is precious, and this poor blog is one of the casualties of this fall! A couple of weeks ago, I was contacted as part of the ZnetShows Design Team to participate in a charitable creative endeavor. It was decided that we would create a bracelet for 7000 Bracelets For Hope, part of the Global Genes Project, an organization I worked with last year when my students needed some community service hours. This organization works to raise awareness and offer support to the thousands of rare diseases that do not receive as much attention as other, more noted diseases. They ask jewelry artists to donate blue bracelets to be given to someone who has been affected by a rare disease or disorder. 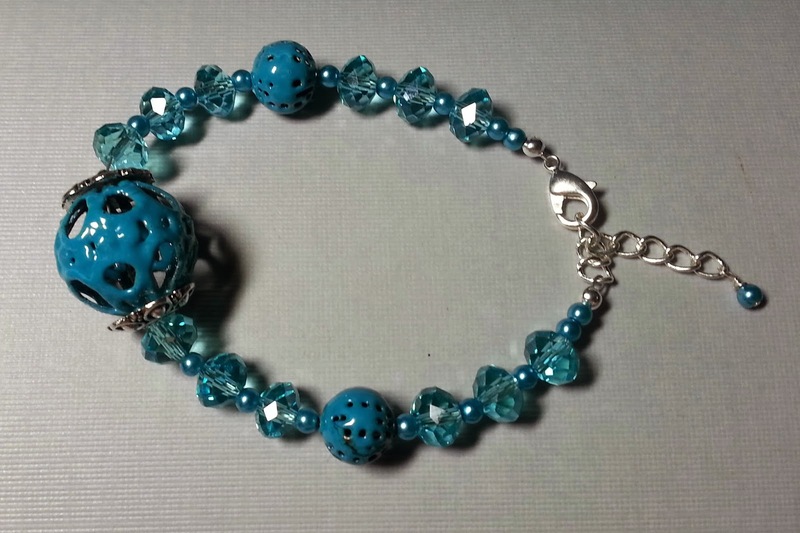 Using some beautiful blue crystals and teeny 3mm glass pearls, I created a bracelet that also featured some of my torch enameled beads in a soothing shade of blue. The crystals are Turquoise colored 6 x 4mm chinese crystals, while the glass pearls are a color called "Montana" (Color K0735). While ZnetShows offered to send me *more* blue beads for this challenge, they were so generous during the sea glass challenge last spring, that I had plenty left in these colors to create a bracelet. I couldn't ask for better colors to complement my enameled beads! I will be sending the bracelet out in the next day or so. If you are interested in donating a blue bracelet to the cause, please see their website for the information and requirements. Also, be sure to visit ZnetShows when you are looking for Chinese crystals and glass pearls! Please let them know that you found them through their 7000 Bracelets For Hope Challenge!